Dinner hour on the docks, Jacksonville, Florida, rc05287. Florida Memory. State Archives of Florida. The Bureau of Refugees, Freedmen, and Abandoned Lands, or the Freedmen’s Bureau, was created by Congress in1865. It was responsible for aiding freed people and refugees, both black and white, during the years of Reconstruction. The Bureau handed out food and clothing, provided medical aid, helped locate lost family members, and ran refugee camps. 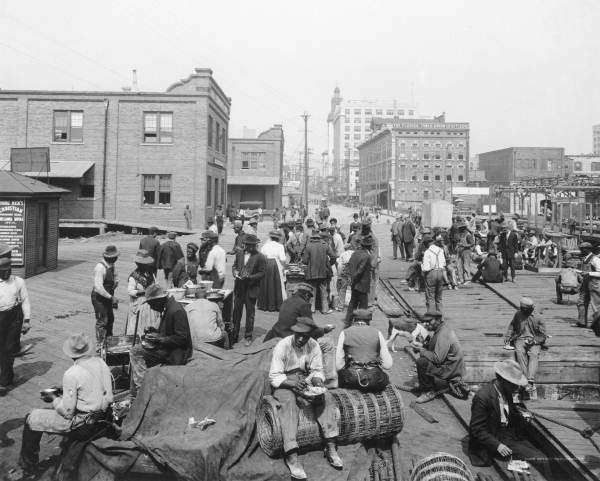 They also arranged for the legalization of marriages, and for legal representation in general; helped secure fair employment opportunities or settled freed people on confiscated lands; and worked with African-American Civil War veterans to make sure they received their pay, pensions, and bounty payment1. The Bureau also helped establish more than 1,000 schools to serve the African-American community. 1 National Archives. The Freedmen’s Bureau, 1865-1872. http://www.archives.gov/research/african-americans/freedmens-bureau/#intro, accessed January 24, 2011.